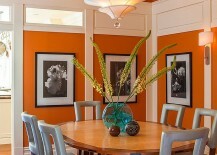 There are some colors that are perceived as too risky to use, and homeowners fear orange is one such color that overwhelms every other feature in any room it adorns. 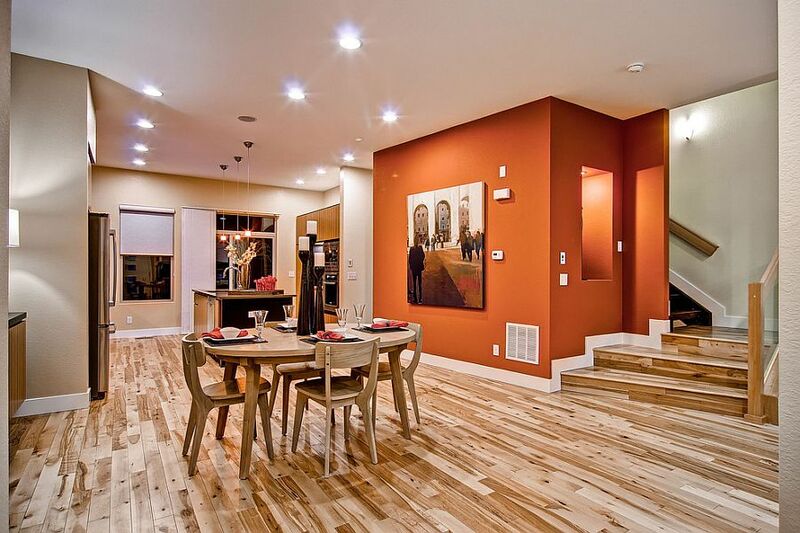 Of course, the reality is anything but that, and it is all about how you use a high-octane color like orange that will make or break the look of the interior. 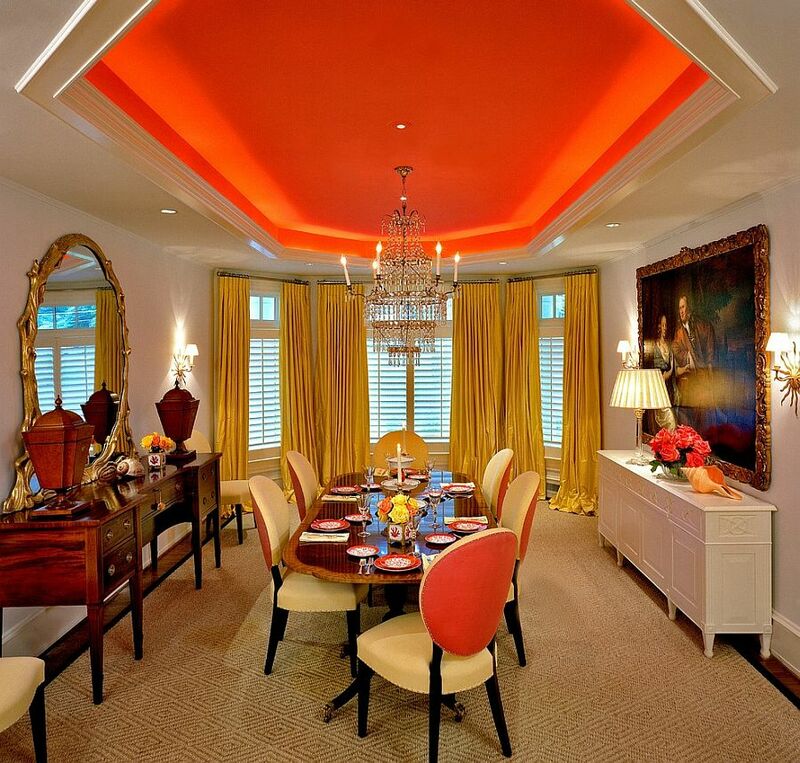 A dining room is probably one of the best places where you can try out orange, its different shades and how to incorporate it in a classy and contemporary fashion before you take it to the living room or the bedroom. 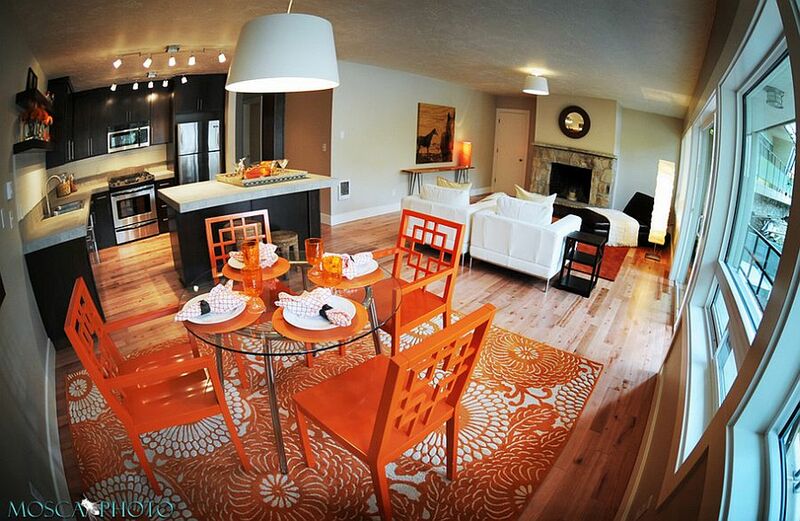 Much like any other color, orange is available in a wide array of shades, hues and intensities. 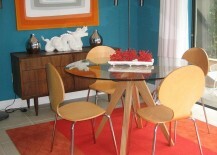 So do not limit yourself to the most obvious or popular choices around. 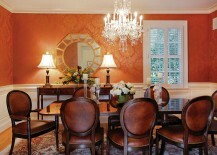 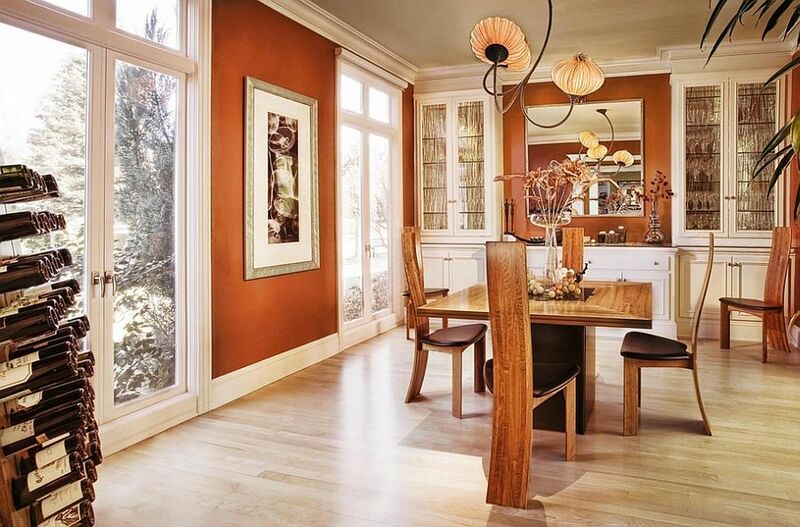 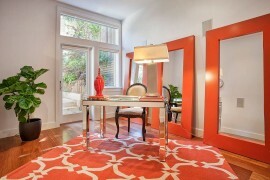 Exciting and flamboyant orange dining rooms combine the formal with the playful in the most exquisite fashion. 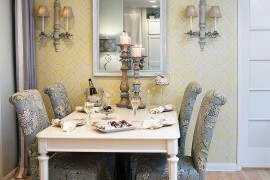 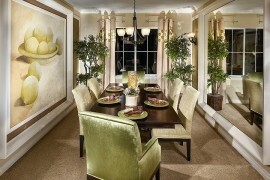 When it comes to adding a new color to the dining room, the most obvious choice is to turn to the walls of course. 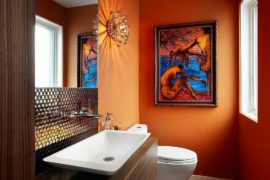 But in the case of a color like orange, it is as much about determining how much the color must be used as it is about picking the right shade. 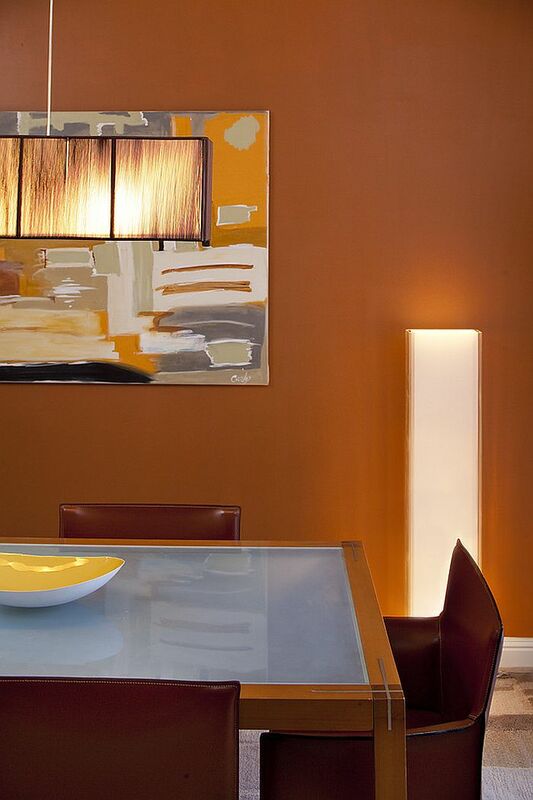 Often, the muted hues with a matte finish can be used extensively, while the brighter versions of orange with yellow or a golden glint need to be employed with far more restraint. 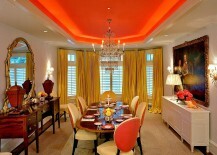 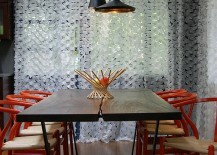 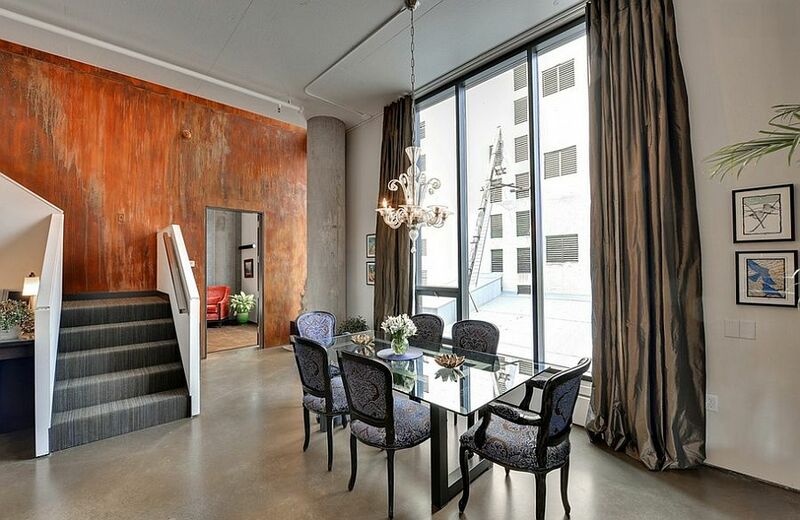 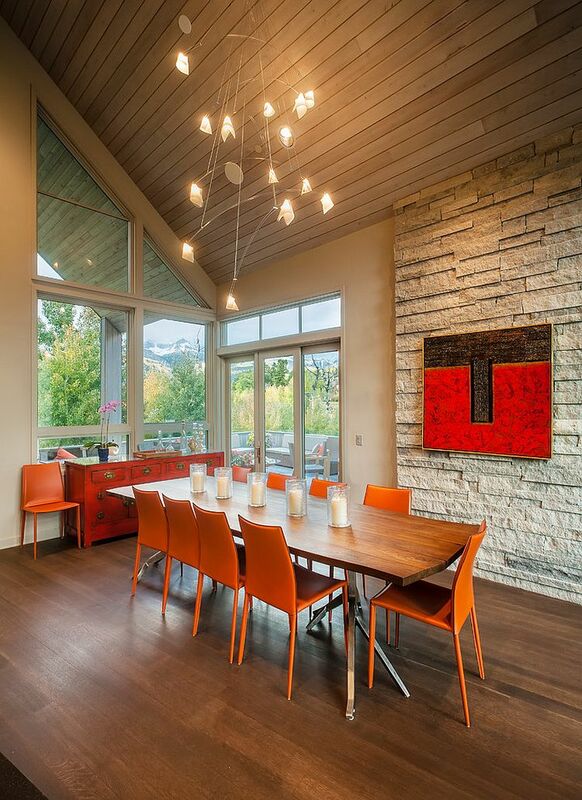 Too much bright orange can create a confused and gaudy dining room that is an eyesore. 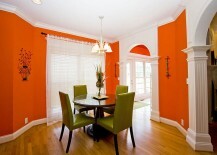 While painting the walls in orange is the most popular option, think of other alternatives before you settle on it. 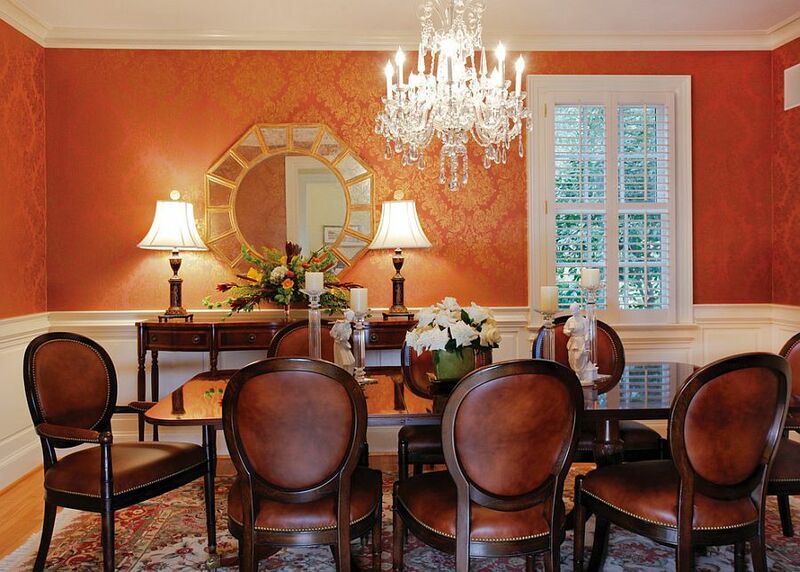 Beautiful wallpaper in burnt orange with a subtle print is a wonderful option, as it brings both color and pattern to the room. 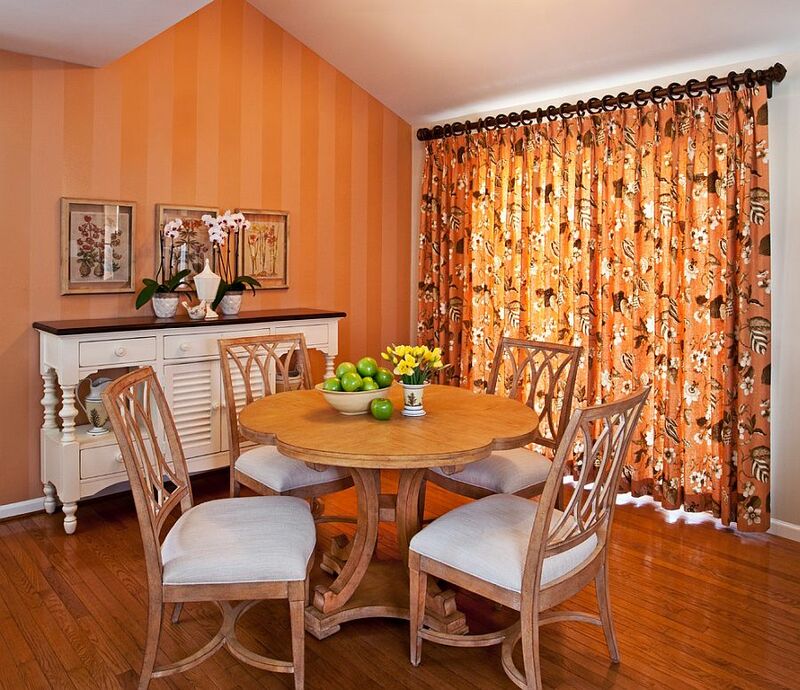 Grasscloth in orange adds texture, while an orange accent wall offers a distinct backdrop for the small dining space in an open plan living area. 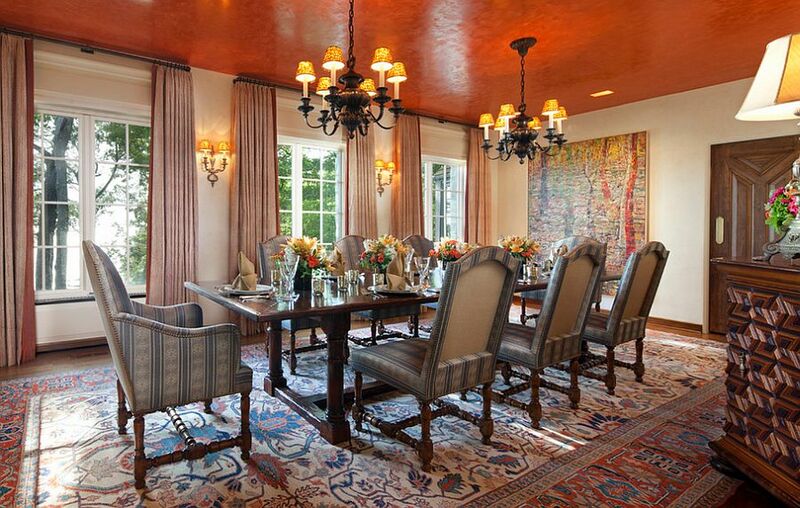 The ceiling is often neglected when it comes to interior design. 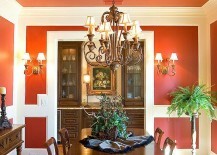 Plain white or a color that matches the one used on the walls is what seems to be the norm the world over. 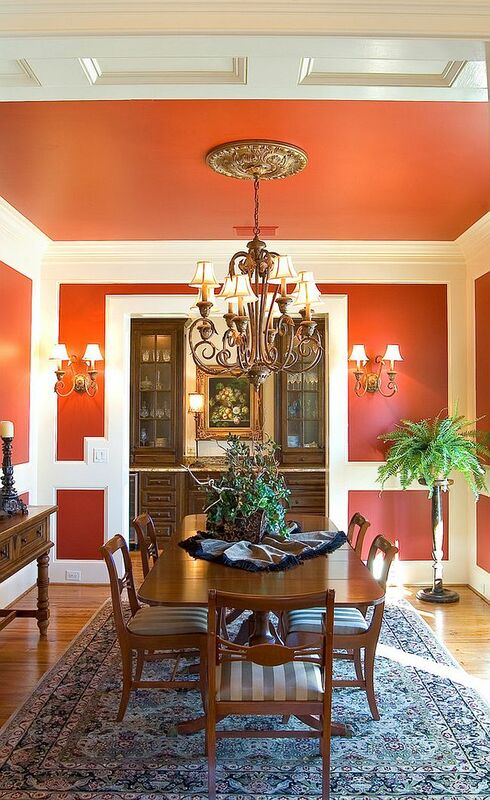 But your ceiling has immense potential that is waiting to be unlocked, and by simply altering its hue, you can give your old dining room a fresh and dazzling makeover. 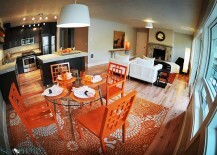 Few colors provide as much visual impact as orange in this regard! 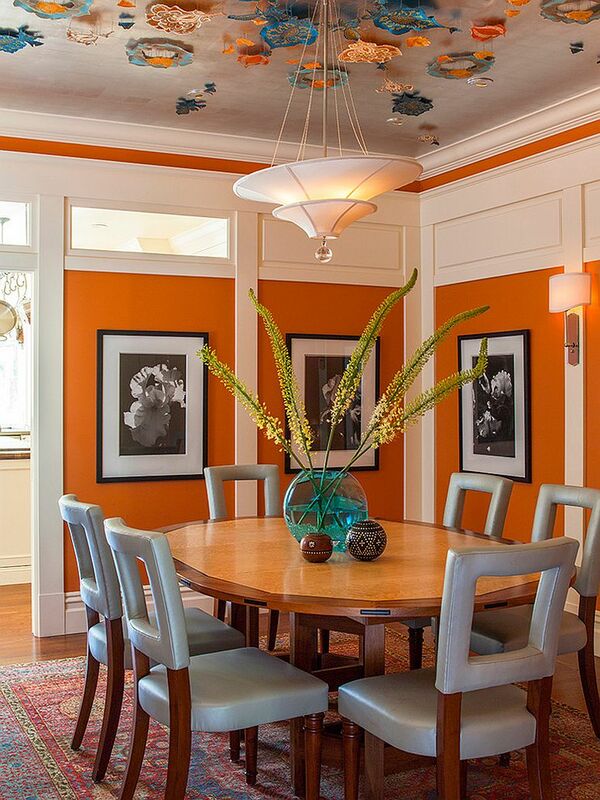 Those with an ornate ceiling inside the dining room can only paint parts of it orange and use black or white for the trims to enhance the color scheme of the room even further. 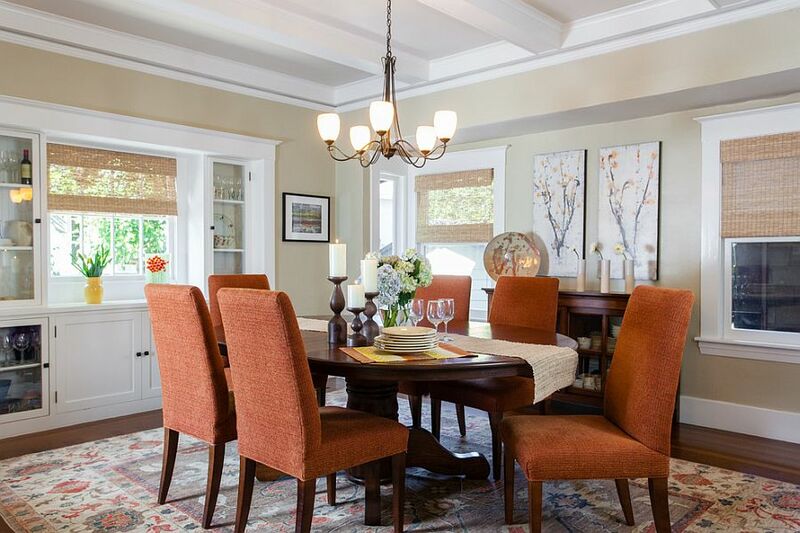 Since most modern homes are adopting a cool, neutral color scheme filled with white, gray and beige, warm orange has shot up the color charts in the last few years. 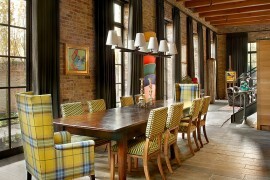 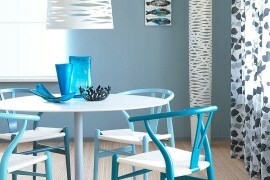 The color offers contrast, creates lovely focal points and enlivens a monotonous setting with its exhilarating panache! 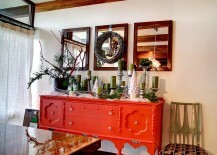 For those who are still a bit trepidatious about using orange extensively, start off with decor additions such as dining table chairs, a buffet or a cabinet in delightful orange. 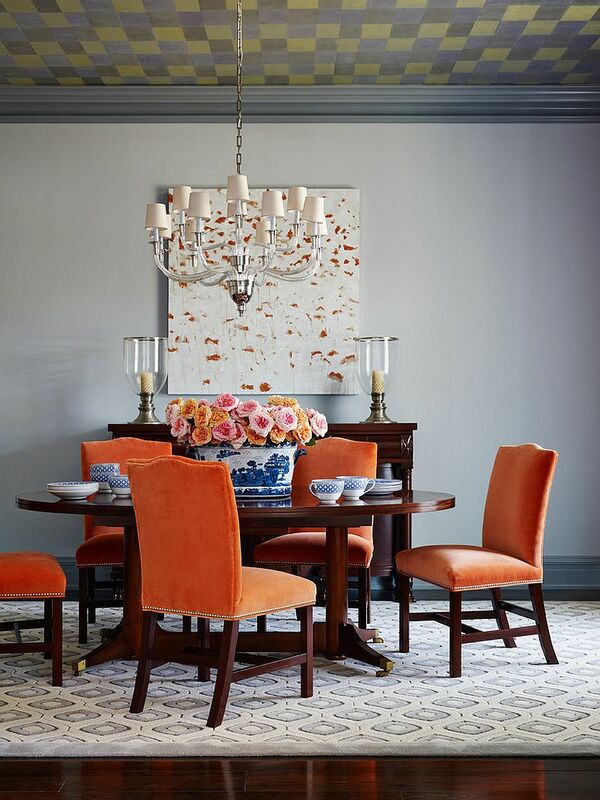 Colors such as burnt orange and pastel orange are currently ‘in’ and would work in almost any dining room, irrespective of the theme you have going. 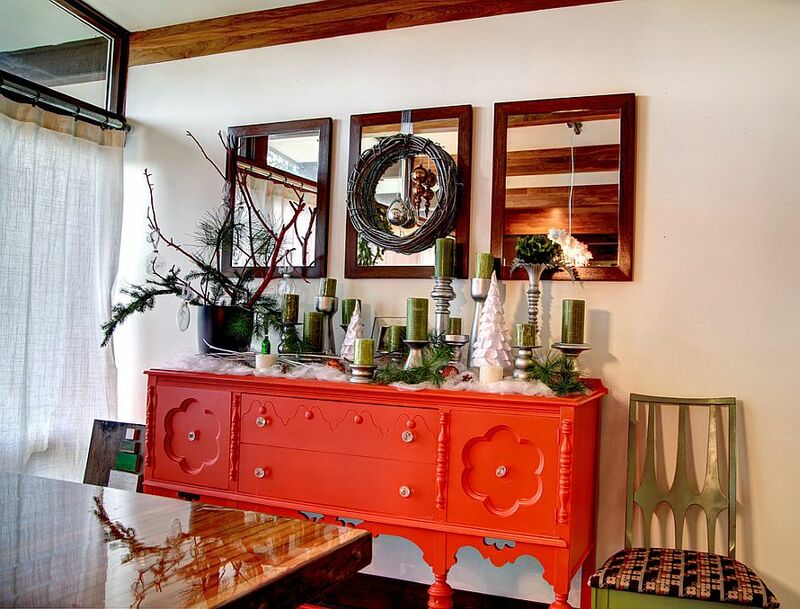 Maybe the color that you love is a bright red-orange with an almost fluorescent glow, and you are very sure that using it even for the decor additions will seem a touch too ungainly. 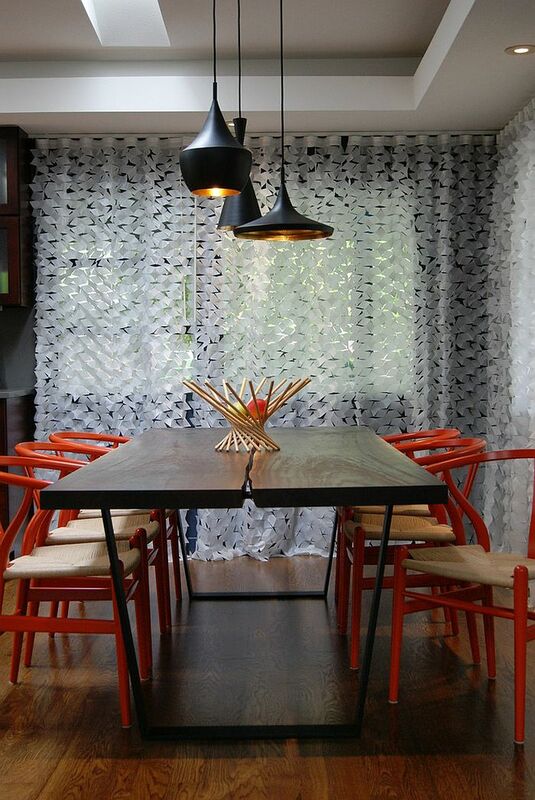 Don’t fret about it too much, as this is where investing in a beautiful dining room with a neutral backdrop comes in incredibly handy! 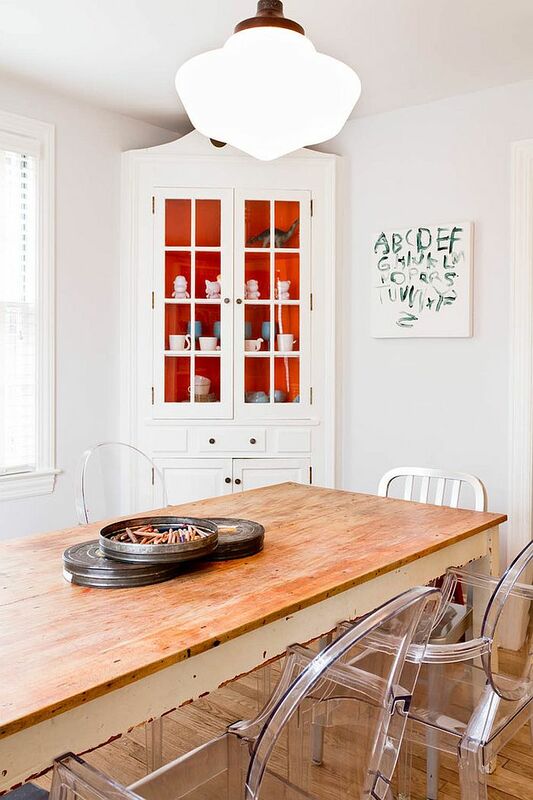 Just add pops of orange in a shade that you love by using accent additions such as wall art, small candles on the dining table or even a brilliant pendant light. 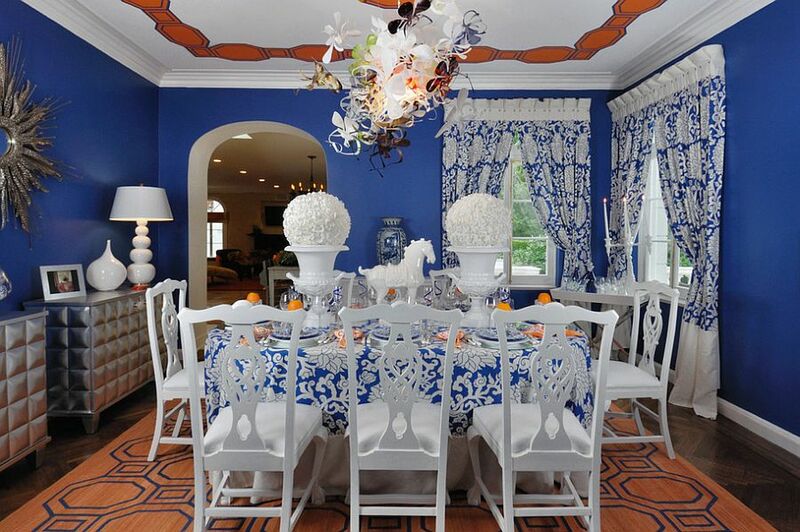 As a rule, repeat the color in more than one place to create the best impact while keeping the rest of the dining area as neutral as possible. 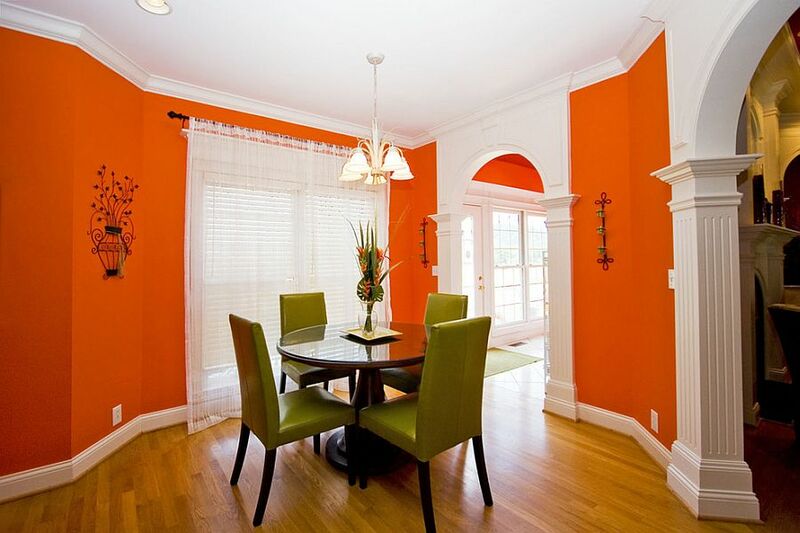 One of the big questions when it comes to dining room color schemes these days is: Does it fit in with the rest of my living area? 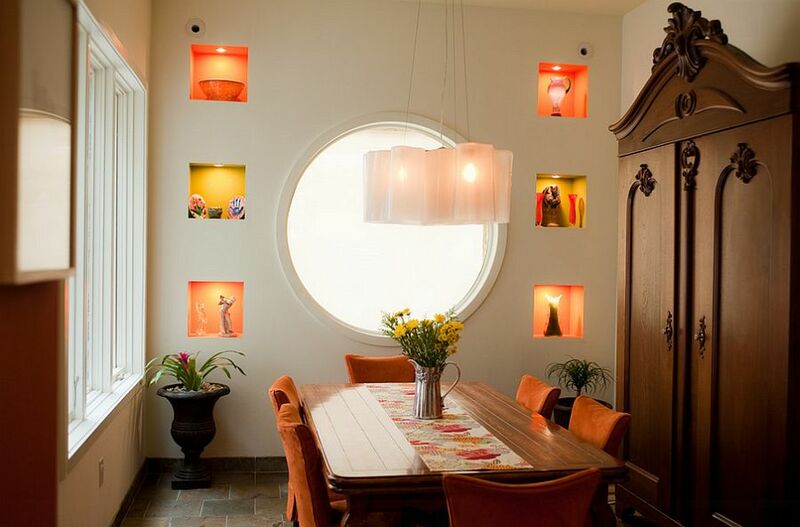 The increase in open plan living spaces has meant that the dining room now needs to blend in with the other contemporary areas of the home while making a visual impact. 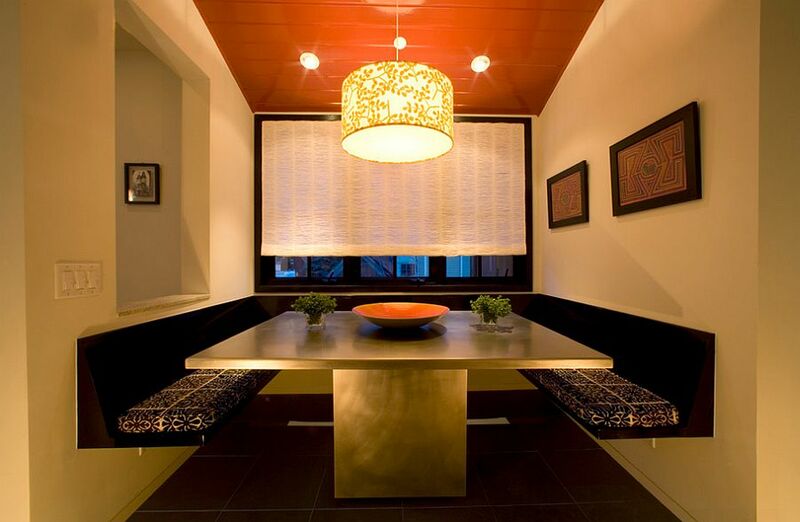 Orange is the perfect way to do this, and you need not even disturb your existing dining space to get the desired results. 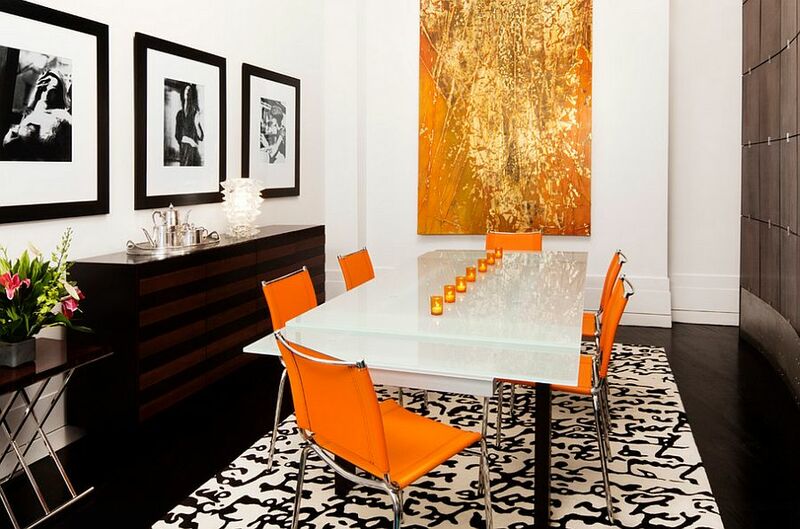 Just throw in a colorful rug in orange and use an accessory or two (maybe a floor vase) to give the dining area a cool personality! 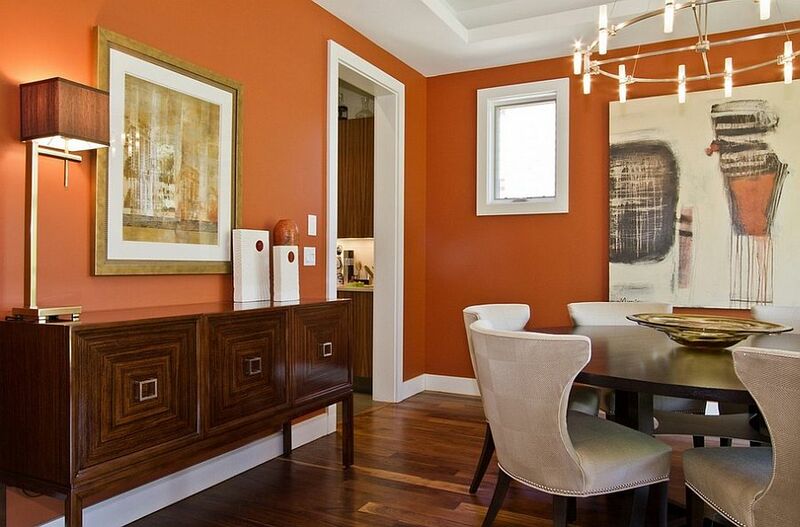 Finding a color that works well along with orange is a lot easier than you think. 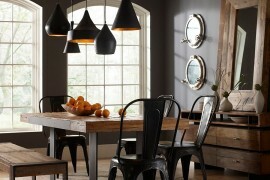 For starters, black is a perennial hit that will work well beyond the Halloween season (And it is not always spooky either!) 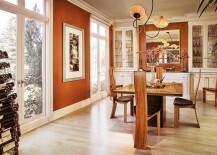 White along with orange can help shape a lovely dining space that is both modern and refined. 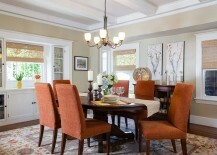 Pops of yellow and gray also seamlessly combine with orange. 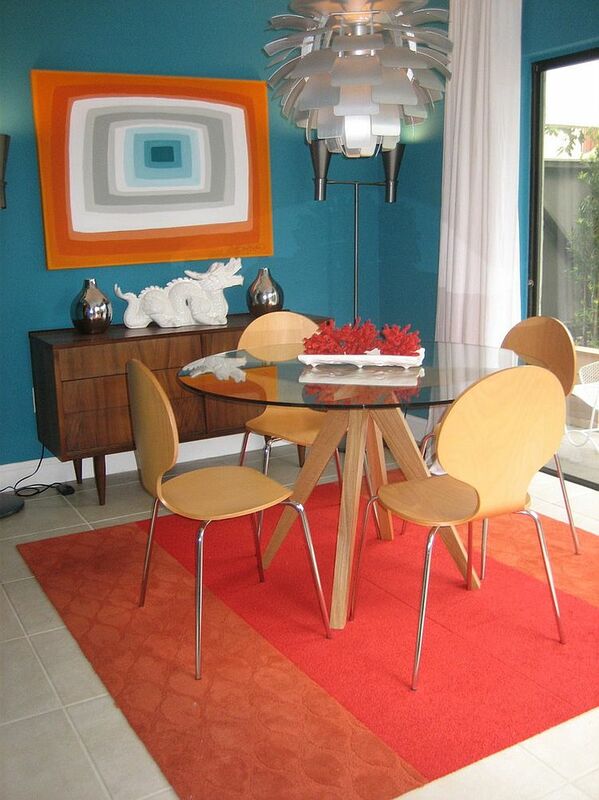 As the inspirations below showcase, some homeowners have even found a way to combine good ol’ blue and green with zesty orange.